Why have a weapon that ‘could’ look like someone else’s? Why not have a weapon that has been specifically made for you? The Hack and Slash team have years of experience in making special design, high fantasy weapons. Why not let us make yours? By providing us with as much visual and written information as you can, you will enable our qualified artists to create your weapon as close to the vision in your mind’s eye as possible. To send us an inquiry is easy! Or find us on Facebook by clicking here and send us a message! weapon design by clicking here. The Whirlwind Axe design was made from a screen grab from the game, World of Warcraft, which was sent in to us. More research followed and we came up with some good results. A nice weapon for any COSPLAYer or World of Warcraft fan! - Although we know this weapon was actually used to beat people with in LARP.. Drawings you send in don't have to be very detailed, so long as the basic shapes are there, which we can work from. You can then tell us the colours you want and we can make it happen! Below are some examples of our sketches. Whilst the shading is quite nice, it's the shapes we're interested in. These are some good examples of the shapes of weapons. If you want us to build a weapon that has very specific measurements, we can do this for you! All you need to do is send us the details and we can work to the dimensions required! 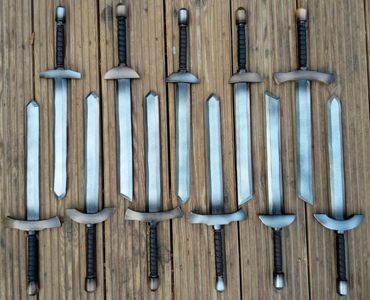 All weapons made by Hack and Slash pass an in-house quality check before being dispatched to the customer. We use a variety of specialized detailing, including freehand painting, vinyl graphics, airbrushing, embossing and engraving. No matter how big the project, our studio is equipped to deal with it and we love our big projects! Hack and Slash have experience in making batches of weapons to meet particular themes for groups who want to maintain continuity throughout. Themed weapons don’t have to mean ‘all the same’, they can be weapons, which, have very different shapes but are painted to seem that they are part of a set. Or maybe you are an organisation that's looking to purchase your own stock of NPC/Monster weapons to use against your players? If so, we can certainly help and make a batch of weapons of varied designs and flavours. Discounts are available for larger orders! Please drop us a line!